"...Marcus Boon, in his book “In Praise of Copying”, writes of the putting together of a mixtape or iTunes playlist in a way that I think reflects the philosophy of these RPG Maker amalgamations: he notes that the process of making a mixtape is “intimate” and “emotionally charged”, and that “the mixtape maker has available in accessing the variety that is essential to copia, and straight out of a classical rhetoric manual: inventio (the selection of tunes to be played),dispositio (the ordering or sequencing of them), and elocutio(the cuts and edits made, but also the loving care put into the handwritten cover, the decoration of the cassette), all deployed in order to charm the recipient of the tape” (Boon 55). Just like the mixtape-maker, the RPG Maker game designer carefully selects the assets they’re going to copy, rearranges and reorders them in new configurations, and also omits, edits, and personalizes these resources to make a product that is uniquely theirs. 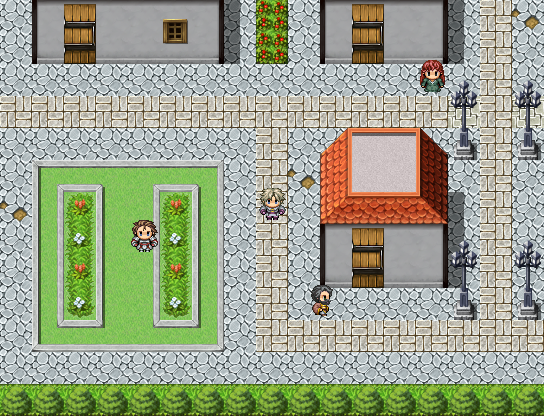 RPG Maker game Final Fantasy Black Moon Prophecy, a fangame of the Final Fantasy series, makes use of assets from Final Fantasy IV, released 25 years ago as of the writing of this probe. The fangame uses a tileset from the game’s town maps, safe zones for the player to recover their strength and restock on items. Black Moon Prophecy, however, edits the tileset and then uses it to map one of the game’s dungeons, Niflheim (Left), a decaying town in which monsters abound. This is another instance of familiar iconography being reconfigured and given new meaning – note the re-use of graphics between Niflheim (Left) and Final Fantasy IV’s town of Baron (Right)"
"...The release of RPG Maker VX Ace coincided with the birth of Steam Greenlight. RPG Maker users started to consider themselves real game developers, and realized they could actually try to sell their games. The result? An explosion of RPG Maker games on Steam Greenlight, often made by teenagers with big dreams but limited skills. And all those games looked the same. Players began to associate RPG Maker's RTPs with mediocre, "lazy" games. The engine got a bad reputation. In a 2016 Reddit thread about why people had begun to hate games made with RPG Maker a community manager who worked for Degica said, "I really wish people who weren't ready for the big time would stop submitting to greenlight. It would make my job easier. Because the perception of RM is already bad enough without people trying to throw their 10 minute effort game on greenlight." On forums and in Steam user reviews the same comments about RPG Maker games recur over and over. They're "low effort and low quality," "look more or less identical," use the same "stock resources." It's enough to put you off using the engine entirely..."